voice to face the rapidly changing socio-economic issues of the times. 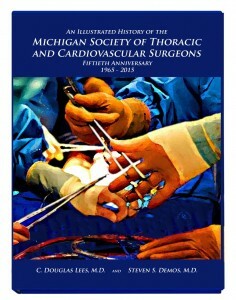 attended by 17 of the 60 board certified thoracic surgeons in Michigan at the time. Secretary-Treasurer, and accepted by the membership. Dr. Cameron Haight was the first President. meet in conjunction with the annual meeting of the umbrella surgical group in the state. away from the meeting by their offices. peripheral vascular surgery and pediatric surgery to compete for awards. organization from the MSTS to the MSTCVS. the membership at the annual meeting held on August 8, 1992 on Drummond Island. A major recent endeavor of the Society is the Quality Assurance initiative that has taken solid form. cardiovascular surgery is provided to every person in Michigan. of the Society get to know one another and their families during this congenial get-together. for a first-rate program in a casual and comfortable setting. We are celebrating our 50th Anniversary this year during our summer meeting. Please join us in celebrating. Click here to register. lungs, true advances in the field of thoracic and cardiac surgery occurred after World War I.
could take over its function to allow corrections on it. the University of Minnesota in Minneapolis as the epicenter of the birth of open heart surgery. successful use of a cardiac bypass machine by Dewey Dodrill, MD in 1952, the year prior to Dr.
well noted in a special publication from The American College of Cardiology fifteen years ago. hallmarks of our state society today. Michigan as the sole site of cardiothoracic training in Michigan. came about at the annual meeting of the society on Drummond Island in 1992.
exactly at the half way point in the 50 year history of the MSTCVS. opportunities to get to know one another as well as our speakers in relaxed, informal settings. whom we have gotten to know over the years. The meetings are of a scale in quality similar to the best national meetings we attend. recognize young surgeons and other physicians who represent the future of medicine. the 17 centers performing this procedure in Michigan. regular basis. This is fertile ground for continued improvement and evolution in our specialty. have attended essentially all of the society annual meetings of the past half century! by side and is equally considered. another 50 years of excellence.